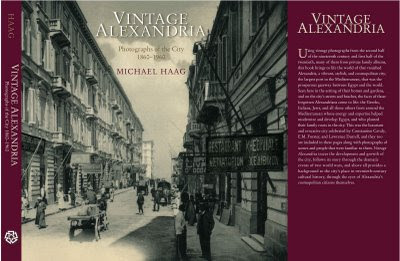 Vintage Alexandria: Photographs of the City 1860-1960, compiled and written by Michael Haag. The American University in Cairo Press, Cairo and New York, 2008. Click on the cover for a full description of the contents. 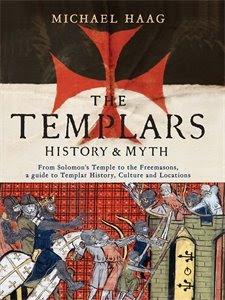 The Templars: History and Myth, by Michael Haag, is published in hardback by Profile Books, London, 2008. Michael Haag has written an extensive introduction to this new edition of the 1925 classic of desert exploration, The Lost Oases by Ahmed Hassanein, published by the American University in Cairo Press, Cairo and New York, 2006. In The Lost Oases, Egyptian explorer and diplomat Ahmed Hassanein tells how he set out by camel from Egypt’s Mediterranean coast and into the unknown reaches of the Sahara. His perilous eight-month journey in 1923 took him round the western edges of the Great Sand Sea to El Obeid in the Sudan, a distance of 2200 miles, and led him to the discovery of the lost oases of Arkenu and Uweinat at the extreme southwest corner of Egypt. At Uweinat Hassanein was amazed to find rock drawings of animals, including lions, giraffes, ostriches and gazelles. He was deep in the trackless desert but what he had found was evidence of a flourishing human existence ten thousand years ago and proof that the Sahara was once green. Hassanein’s discovery excited the imaginations of later European explorers such as Ralph Bagnold and Ladislaus Almásy, the model for the eponymous character in The English Patient. But Hassanein was there first, travelling by camel with Bedouin guides, encountering the mysterious Senussi brotherhood in Libya, and confirming the existence of the long-forgotten oases. First published in 1925 and long out of print, The Lost Oases is now available for another generation of readers in this new edition, which includes an introduction by Michael Haag on Hassanein, his life and his accomplishments. Copiously illustrated with Hassanein’s own photographs, this is a gripping travel narrative by one of the twentieth century's most important explorers. This book is a literary, social and political portrait of Alexandria at a high point of its history. Drawing on diaries, letters and interviews, Michael Haag recovers the lost life of the city, its cosmopolitan inhabitants and its literary characters. Located on the coast of Africa yet rich in historical associations with Western civilisation, Alexandria was home to an exotic variety of people whose cosmopolitan families had long been rooted in the commerce and the culture of the entire Mediterranean world. Alexandria famously excited the imaginations of writers, and this book folds intimate accounts of E. M. Forster, Greek poet Constantine Cavafy and Lawrence Durrell into the story of its inhabitants. It recounts the city’s experience of the two world wars and explores the communities that gave Alexandria its unique flavour: the Greek, the Italian and the Jewish. The book deftly harnesses the sexual and emotional charge of cosmopolitan life in this extraordinary city, and highlights the social and political changes over the decades that finally led to Nasser’s Egypt. 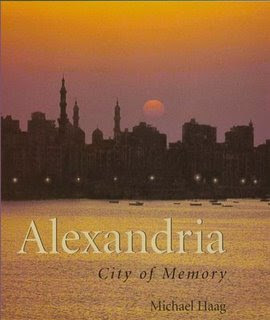 Alexandria: City of Memory has also been published in Greek translation by Oceanida Publishing, Athens 2005. Michael Haag's book Alexandria: City of Memory is a judicious mix of history, biography and literary scholarship with a dash of political thriller thrown in. ... Its aim is to capture the feel of historical Alexandria – city of the Ptolemies, of Callimachus, Theocritus and Cavafy – before two world wars and Arabic nationalism changed it forever. ... For Forster the talismanic Cavafy poem had been The God Abandons Antony; for Durrell it was The City. Both, of course, centre on the loss of a city of the imagination. Now the historical Alexandria, too, exists only in memory. Its fate calls to mind that of other cosmopolitan centres reduced by ethnic nationalism to a shadow of their past glory – Smyrna, Salonica and Constantinople, to name but three. Haag's careful and well-written book is a fine elegy and tribute to Alexandria. 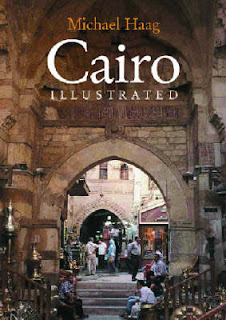 Cairo Illustrated is written and photographed by Michael Haag and is published by The American University in Cairo Press, Cairo and New York, 2006. 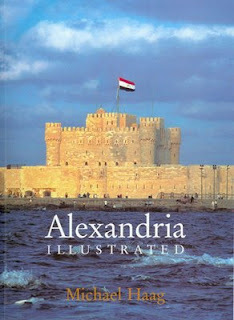 Alexandria Illustrated, written and photographed by Michael Haag, is published by The American University in Cairo Press, Cairo and New York, 2004. This warm and richly illustrated portrait of one of the world’s most famous cities is a fascinating armchair tour of the pageant that is Alexandria. It explores the city’s past and present in word and picture, from the ancient Pharos to the new Bibliotheca Alexandrina, from Pompey's Pillar to Pastroudis. This book also evocatively recaptures the flavour of cosmopolitan Alexandria, its carnival architecture and the city's literary associations with Constantine Cavafy, E M Forster and Lawrence Durrell.